The Daily Digress: I love being a grown-up. I love being a grown-up. All my dreams have come true. When I was about ten years old, around the time my Nana got me a subscription to Vogue , I saw a Cartier Tank Française and thought, "Yup." And I was willing to wait. While I waited, I got married, stayed married and co-produced three adorable sons, never once complaining about not receiving jewelry, because I had a plan. Just before our tenth anniversary, I announced I had done the math and it was time for the Tank. Now that I think about it, such diabolical selfishness is probably one reason the other Tank, the mad toddler, came my way. All's well that ends well, n'est-ce pas? Though he tries my patience, 99.9% of humans would agree he is beyond adorable. And I really love the watch*. There was something else I wanted, besides a baby blue Jaguar. Big hair. And I knew how to get it. 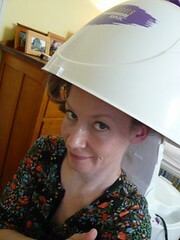 After careful research, I determined the most efficient route to big hair - big curlers on wet hair under a hood dryer. My poor ten-year-old self felt very sad, as I believed such things were only available in salons. Even a ten-year-old knows you have to be pretty rich to afford a professional set twice a week, so I collected good grades in hopes of going to a good college so I could get a great job and afford to have my hair set twice a week. I don't really like hard work, but I was willing to do what had to be done. Over the years, I experimented, with varying results. Pink foam curlers worn overnight on wet hair didn't work for long hair, which would still be wet in the morning. Also, they ripped out half my hair. Hard plastic curlers were too hard to sleep in. Ouch. Ditto velcro and wire curlers. They worked a little better under my mother's vintage bonnet dryer, but that took hours and there was a pretty serious risk of electrocution. Also, it burned my ears and scalp pretty bad. Blow-drying by hand with a big round brush. Took too long, hair got tangled and flyaway pieces inadvertently dried frizzy. Blow-drying by hand followed by extensive use of a curling iron was a decent option, but very time-consuming. Also, I needed one or two more arms to do it well. Blow-drying by hand followed by hot rollers works okay, but the style doesn't hold, no matter how many products I use. At some point, I learned that hood dryers were available for private use at home. I have no idea why I never did my research**, but I assumed they were thousands of dollars and dismissed the idea. Why did no one ever tell me? These things are less than $100. Several days before Christmas, I broke my own rule about not buying stuff for yourself right before a holiday and drunkenly ordered a hood dryer, after reading a bunch of reviews, getting confused, pouring another glass of bubbly and picking one based on the fact one random person in Texas said it was big enough for really big curlers extensive research. My new Hot Tools 1875W Anti-Static IONIC Salon Hair Dryer was only $44.99. And I got free shipping. See how happy I am? Bonus: I can't hear a thing under the dryer. If two kids are fighting and no parents hear it, did they still have a fight? I think not! 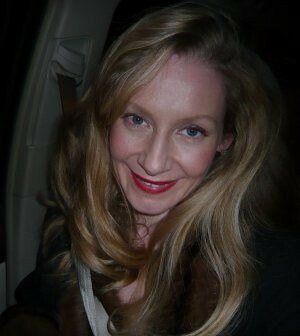 See how happy I am sitting in the car taking pictures of myself after an entire bottle of bubbly at Dianne's on new Year's Eve with my big hair? And that set, pumped full of Elnett bien sûr, lasted for several days. All for the low, low price of $44.99. And free shipping. Can you hear the music swelling in the background? P.S. Please see important addenda to this entry here. Merci. * In my defense, I only ever wanted the stainless steel version. In fact, my dear husband asked if I wanted to hold out for the Tank with diamonds and I didn't. Because that would look silly in the day time and wearing a watch at night makes you look uptight. I don't wear a watch at night, because I like to party. ** Oh yeah. When Grandma was little there was no internet. And my mama wasn't the type to take me to beauty stores. i want a baby blue jag too. the ones that look "smooshed". now the question is: what sort of rollers did you use? the really big velcro ones? I have to ask... did the baby blue Jag come from Nancy Drew? Yes, I was obsessed with her as a kid. I didn't know they still made portable hood dryers! My mother has always been oddly obsessed about my hair, and there is a picture somewhere of me around the age of 4 sitting under one of those things on a pile of pillows with a book in my lap. She made me do it every week! I love, love, love the hair! I am so jealous. That is the exact look I spent all of the '90s trying to perm into my stick straight hair with no luck. It was a bad hair decade in retrospect. Maybe I need a hood dyer too. Jag-u-waaaas are my all-time favorite too!